We were guessing Nissan to be planting strategies for Indian market very seriously, but surprisingly we found out that it has kept itself going strong in the neighboring markets with the exports from India. To an evidence, Nissan Motor India Pvt. 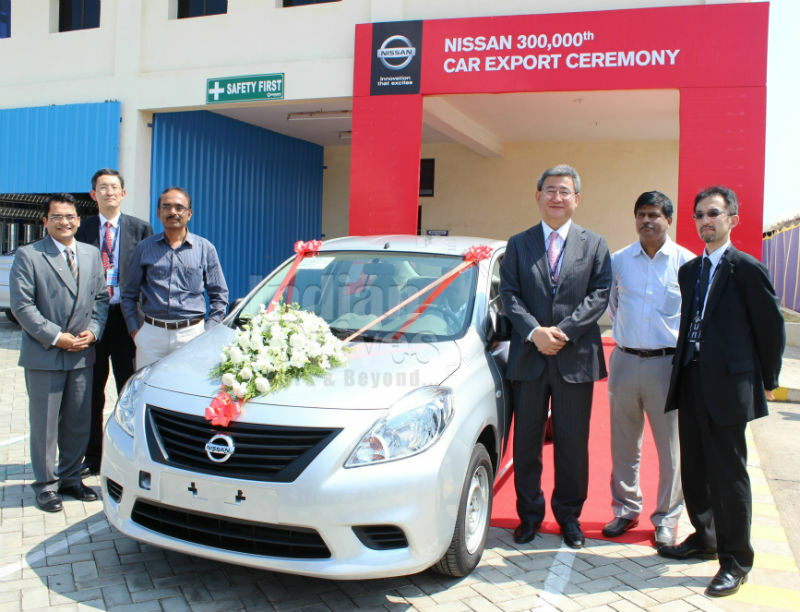 Ltd. (NMIPL) recently flagged-off its 300,000th car for export from Ennore Port Ltd. (EPL) (of India) in the presence of Mr. Kenichiro Yomura , President – Nissan India, Mr. Baskarachar, MD and Chairman, Ennore Port, Chennai, Mr. Hideki Maebashi, Head of Exports and Mr. Atul Shahane, General Manager, Vehicle Exports, Nissan Motor India Pvt. Ltd.
To make a one known, Nissan initiated its exports from the Ennore port in September 2010 and was the first motor company to use the Ennore port as the export gateway. Calculating a brief, in the period of just three years the Japanese carmaker has crossed the figure of 300,000 lakh units (in export), which we can say is just overwhelming looking at the current market scenario. Regions covered under its hat (from the Indian export) are Africa, Middle East and Europe, grossing the number of more than 100 countries/regions at a take. Year 2008 earmarked the Nissan for signing its first MoU with Ennore Port Ltd. (EPL) to export its vehicles to various countries. While in July 2013, the agreement between Ennore Port and Nissan was upgraded to include more parking space and priority handling of vehicle units inside the port. This agreement is now made valid for the coming 10 years. The manufacturing plant of Nissan at Oragadam near Chennai was set up in 2008 by pumping an investment of Rs. 45 billion, toiled over a period of 7 years. Now, it operates in full compliance with the Alliance Global Manufacturing Processes and Quality Standards. On March 17, 2010, the Renault Nissan Automotive India Pvt. Ltd. Manufacturing plant (RNAIPL) was inaugurated in a record time of 21 months and remains the cornerstone of the Renault Nissan Alliance’s plans for India and for establishing a meaningful presence in high-growth markets like India – while keeping pace with rapid changes in the world’s auto industry.